Happy Celiac Disease Awareness Month! Happy Food Allergy Awareness Week! If you are living with food allergies, Celiac disease, food intolerances, or any other dietary restrictions, you are already used to adapting your menu. But what happens when one person wants to be a vegetarian? or you move into a home where people eat dairy? or your children have opposing allergies? or you have one kid who loves peppers and another who hates them? You learn how to adapt your menus so you can make (almost) everyone happy with one meal. After 11 years on the food allergy/intolerance roller coaster I got on soon after becoming a mother, I’ve rethought my approach to food many times. I think that I was lucky, as I had been a vegetarian for several years before I became a mom, and so I was used to the idea of reading ingredients and cooking from scratch. Label reading is hugely important for food allergies/intolerances, and since I was already accustomed to looking for hidden ingredients, I had a leg up on the challenge of grocery shopping. Additionally, since I was not using many prepared foods already, it was easier to just change the ingredients in my cooking; I didn’t need to suddenly learn to cook. 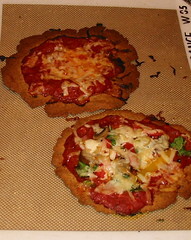 The challenges I think any parent of a child with food restrictions needs to accept are Adaptability and Love of cooking. If you can accept those, you’re going to be ok. As a cook who had been very successful in the past, I had a very hard time accepting that some of my first gluten-free creations had to be tossed outside for the birds and squirrels. I had become too accustomed to being complimented on my cooking! This was also good preparation for when my kids got older… However, I now pride myself on making great food despite the food restrictions, and I’m hearing a lot of compliments again! 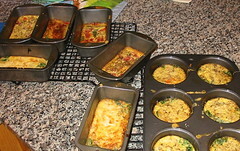 For Mother’s Day, I made a double batch of quiches, and made them in individual sizes so each person could have the ingredients she wanted. This meant that those who like soy “cheese” could have some, and those who like bacon can enjoy without upsetting the new vegetarian. 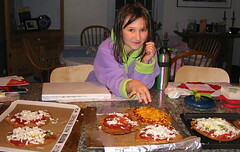 Individual pizzas, quiches, mexican pizzas (tortilla, refried beans, ground meat, salsa, soy or dairy cheese), and tacos are some incredibly easy ways of letting each child eat the ingredients she loves. One of my favorite adaptation methods is “on the side”. I loved When Harry Met Sally, and I’m afraid I may sound like Sally when I’m in a restaurant! However, at home I have embraced that concept with my daughters. We make salads with dressing on the side, of course, but also make Pad Thai with the shrimp, limes, and peanuts on the side, a risotto with meat and/or cheese on the side, a vegetable curry with meat and some veggies on the side, or make a meal of pasta or polenta with marinara or White Sauce and sausages or meatballs on the side. I’ve told my daughters many times that they aren’t “allowed” to be picky because they have so many dietary restrictions. This doesn’t actually work, but it’s a good idea, and honestly they are much less picky than most kids I know! My daughters have been told that they can quietly push ingredients they dislike to the side when they are served their meal, but they cannot throw a fit. Again, it’s a good theory, and it does work with a lot of casseroles. I think that by doing quite a bit of “on the side” or individual meals, they might be more willing to accept a rogue mushroom or pea in their soup! It’s amazing how a simple strategy, such as starting with one base and then expanding that for individual tastes, is a good way of making almost everyone happy. Set aside a section of the grill for the vegetarian, toast rolls on foil rather than the grill, so the grill doesn’t end up with gluten on it, and make everyone plain hamburgers, letting people add dairy or soy cheese once they are served. When you start to think about meals in a new way, a way where everyone can enjoy a similar meal, you can find new ways to deconstruct dinner. A buffet of choices for pizzas or ice cream sundaes becomes more fun, not just a way to accommodate food allergies and pickiness! Shifting your perspective to fun rather than a chore can help you enjoy your meals, too – not just feel like you need to get through them somehow.